You may not be able to afford a right royal road trip in the Sunshine State, a la Prince Charles and Duchess Camilla, but as we found out, it needn’t cost a lot to see the very best Queensland has to offer. It’s no secret that it’s easy to fall in love with Queensland – just ask a Queenslander. Or you could ask Prince Charles and Duchess Camilla. Because as part of this year’s Commonwealth Games, the royal pair have travelled to some of the best destinations the Sunshine State has to offer. Lucky them. For those wanting to follow in their royal footsteps, the good news is that the highlight-strewn route is relatively easy to do. In fact, the royals travelled, for the most part, along Queensland’s majestic Pacific Coast Way. The drive, which links coastal havens, hinterland towns, and cities along the east coast from the Gold Coast to Cairns, offers unparalleled driving scenery and can be explored in a matter of days. A must-visit for any traveller visiting the Sunshine State, Brisbane has shed its ‘big country town’ image and is now home to great shopping, dining and cultural experiences. Must-see: No trip to Brisbane is complete without a visit to the Southbank Cultural Precinct. The area’s claim to fame is Streets Beach, the man-made beach in the centre of town, but it’s also home to great bars and restaurants, as well as the city’s major cultural landmarks, including the Queensland Museum and GOMA (Gallery of Modern Art). Must-try: Don’t miss the vibrant Eat Street Northshore market, which features scores of food trucks and interesting cuisine from around the world, alongside live music, all housed in old shipping containers reclaimed from the nearby port. Must-do: Jump aboard a ferry for the short ride to nearby Moreton Island for a taste of adventure. There, you can toboggan down giant sand dunes, snorkel the Tangalooma wrecks, feed wild dolphins at sunset and go parasailing. When the royals hit Australia’s favourite playground, Broadbeach was among one of their first pit stops, before getting into the thick of it in Surfers Paradise. Must-see: While the Gold Coast is all about the beach, its other waterways shouldn’t be ignored. You’ve got to see the other side of the coast on a Surfers Paradise Cruise, which will give you a glimpse into the area’s beautiful canals, and get you up close and personal with the dolphins. Must-try: A cruise isn’t the only way to experience the Gold Coast’s waterways. Swim and snorkel with hundreds of tropical fish, sail past stingrays and enjoy a memorable lunch on Wavebreak Island as part of a Seaway Kayaking Tour. Must-do: Thrill-seekers shouldn’t miss a rollercoaster-like ride along the Gold Coast’s waterways with Paradise Jet Boating. With 360-degree spins and high-speed drifting thrown in, we can’t imagine Prince Charles being thrown back and forth, but it’s well worth the ride – if you’re okay with getting absolutely drenched. Situated on the Burnett River, Bundaberg is perhaps most famously known for Bundaberg Rum. While Prince Charles indulged in a taste of the area’s famous export, Bundy City actually has so much more to offer. Must-see: Every year, Bundaberg plays host to thousands of baby turtles who take their first breaths and make the journey along the beach from nest to sea. There are two key milestones of the turtle hatching season: adult turtles begin digging their nests and laying their eggs from November to January; then in mid-January to mid-March the baby turtles hatch. The best place to witness either is in the comfort of Mon Repos Turtle Rookery. Must-try: Sample the region’s fresh produce and great cuisine on a Bundy Food Tour. Hosted by Le Cordon Bleu Master of Gastronomic Tourism graduate Suzie Clarke, the small-group tour goes behind the scenes at the farms, traditional butcher shops and seafood specialists that produce Bundaberg’s best nosh. Must-do: A day trip from Bundaberg to visit Lady Musgrave Island is a must. Tour, snorkel and scuba dive the coral cays and lagoons of the Great Barrier Reef’s second southern-most island. 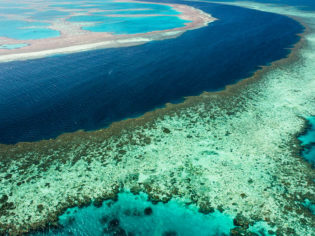 Ahead of Charles and Camilla’s visit to the Reef’s southern end, the couple issued a call-to-arms to position the Great Barrier Reef at the centre of the ‘blue economy,’ a relatively new idea designed to protect and grow the world’s majestic natural environments, using economic growth as a driving factor. Must-see: A trip to the Great Barrier Reef isn’t complete without spotting the ‘Great Eight,’ the region’s answer to an African Safari’s Big Five. Must-see animals include clownfish, manta rays, Maori wrasse, giant clams and whales. Lady Elliot Island, which is located in a Marine National Park Green Zone, is a wildlife-spotting hub, with more than 1,200 species of marine life in the area. Must-try: Heron Island is the perfect spot to take a break from the road trip action with beaches to relax on, far, far away from the hustle and bustle of the crowds. Must-do: In the town of 1770, don’t be surprised to see a couple of hot pink vehicles cruising both the streets and the waterways. You can see the town’s in- and out-of-water hotspots in the amphibious ‘boats-with-wheels’ LARCs. The Prince of Wales may have been welcomed to the Daintree by a mass of local fans, but thankfully your welcome should be a little calmer. Located on the north east coast of Queensland, the Daintree Rainforest’s lush natural scenery will transport you into a 165-million-year old tropical oasis unlike any other, helping you to relax and unwind quickly. Must-see: Daintree Wonder Tours is a must for the area’s highlights. Naturalist guide Dave Mainwaring, who has spent much of the past decade exploring the national park, and his zoologist wife, Jenna, will happily show you the Daintree’s highlights. Both are strong advocates for environmental protection. Must-try: While Charles and Camilla might not have dipped in the water here, there are plenty of opportunities for canoeing, surfing, sailing and scuba diving in and around the Daintree. More information: To plan your royal tour inspired road trip along Pacific Coast Way, visit Queensland.com/drive or download the Queensland Drive e-book.